The Planck time: 10-43 seconds. After this time gravity can be considered to be a classical background in which particles and fields evolve following quantum mechanics. A region about 10-33 cm across is homogeneous and isotropic, The temperature is T=1032K. Inflation begins. In Linde's chaotic inflation model inflation starts at the Planck time, although it could start when the temperature falls to point at which the symmetry of Grand Unified Theory (GUT) is spontaneously broken. This occurs when the temperature is around 1027 to 1028K at 10-35 seconds after the Big Bang. Inflation ends. The time is 10-33 seconds, the temperature is again 1027 to 1028K as the vacuum energy density that drove inflation is converted into heat. At the end of inflation the expansion rate is so fast that the apparent age of the Universe [1/H] is only 10-35 seconds. Because of inflation, the homogeneous regions from the Planck time are at least 100 cm across, a growth by a factor greater than 1035 since the Planck time. However, quantum fluctuations during inflation also create a pattern of low amplitude inhomogeneities with a random pattern having equal power on all scales. Baryogenesis: a small difference between the reaction rates for matter and antimatter leads to a mix with about 100,000,001 protons for every 100,000,000 antiprotons (and 100,000,000 photons). Universe grows and cools until 0.0001 seconds after the Big Bang with temperature about T=1013 K. Antiprotons annihilate with protons leaving only matter, but with a very large number of photons per surviving proton and neutron. Universe grows and cools until 1 second after the Big Bang, with temperature T=1010 K. The weak interaction freezes out with a proton/neutron ratio of about 6. The homogeneous patch is now at least 1019.5 cm across. Universe grows and cools until 100 seconds after the Big Bang. The temperature is 1 billion degrees, 109 K. Electrons and positrons annihilate to make more photons, while protons and neutrons combine to make deuterons. Almost all of the deuterons combine to make helium. The final result is about 3/4 hydrogen, 1/4 helium by mass; deuteron/proton ratio 30 parts per million. There are about 2 billion photons per proton or neutron. 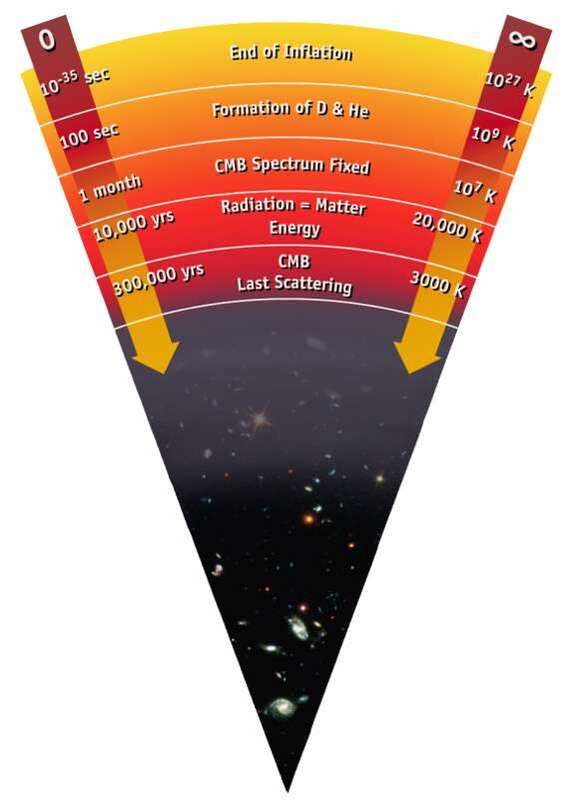 One month after the Big Bang the processes that convert the radiation field to a blackbody spectrum become slower than the expansion of the Universe, so the spectrum of the Cosmic Microwave Background (CMB) preserves information back to this time. Matter density equals radiation density 56,000 years after the Big Bang. The temperature is 9000 K. Dark matter inhomogeneities can start to collapse. Protons and electrons combine to form neutral hydrogen. Universe becomes transparent. Temperature is T=3000 K, time is 380,000 years after the Big Bang. Ordinary matter can now fall into the dark matter clumps. The CMB travels freely from this time until now, so the CMB anisotropy gives a picture of the Universe at this time. The first stars form 100-200 million years after the Big Bang, and reionize the Universe. The first supernovae explode and spread carbon, nitrogen, oxygen, silicon, magnesium, iron, and so on up through uranium throughout the Universe. Galaxies form as many clumps of dark matter, stars and gas merge together. The Solar System and Sun form 4.6 billion years ago. Now: The time is 13.7 Gyr after the Big Bang, and the temperature is T=2.725 K. The homogeneous patch is at least 1029 cm across, which is larger than observable Universe.